If we think it unreasonable to expect ourselves to rejoice in suffering, try looking at the other side: Isn’t it unreasonable not to rejoice? 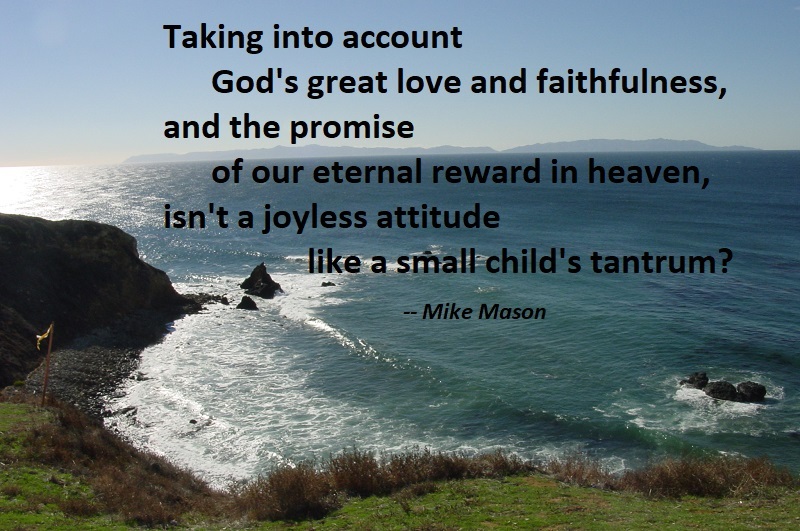 Taking into account God’s great love and faithfulness, and the promise of our eternal reward in heaven, isn’t a joyless attitude like a small child’s tantrum? Feeling powerless, we either shut down or throw a fit as the only means of retaliating against the one who does hold power. Unhappiness is a form of pouting. It’s a way of saying, “I shouldn’t suffer like this; it’s scandalous; I don’t deserve it and I won’t accept it.” Fine. Your unhappiness will continue until you do accept it. You’d rather be right than happy. Anyone can “consider it pure joy” when everything goes well. The time when such an attitude really counts is when “you face trials of many kinds.” Happy people can have just as many problems as unhappy ones. The difference is that unhappy people hate having problems, whereas happy people are content to work through their problems, finding joy in spite of and even because of them. 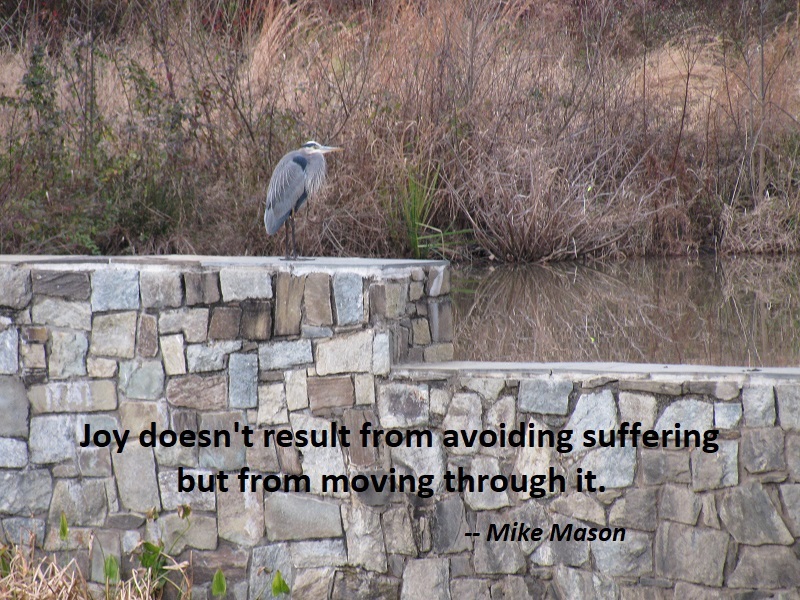 Joy doesn’t result from avoiding suffering but from moving through it. If there’s a shortcut to happiness, it’s through trials. 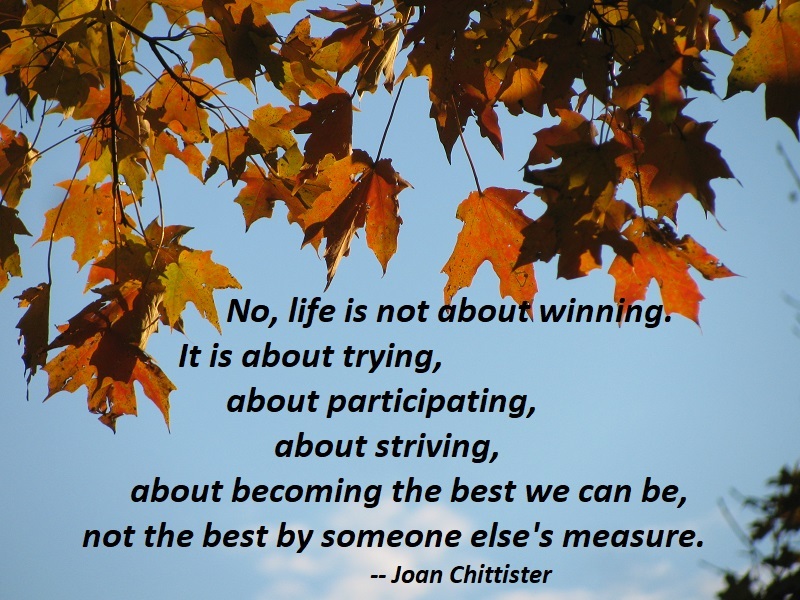 No, life is not about winning. It is about trying, about participating, about striving, about becoming the best we can be, not the best by someone else’s measure. That’s what failure does for us. It teaches us about ourselves: our energy level, our endurance level, what we’re naturally good at and what we’re not, what we like and what we don’t, what it means to do something just for the fun of it. Failure doesn’t mean that we cannot compete; it doesn’t mean not to give everything we have to doing what we do. It does mean that just because we play we don’t have to win. The playing is the thing. Most of all, it gives us the permission to go through life without public certification. Failure enables us to take risks as we grow until we find where we really fit, where we can not only succeed, but also enjoy the challenges of life as well. No, winning is not everything. 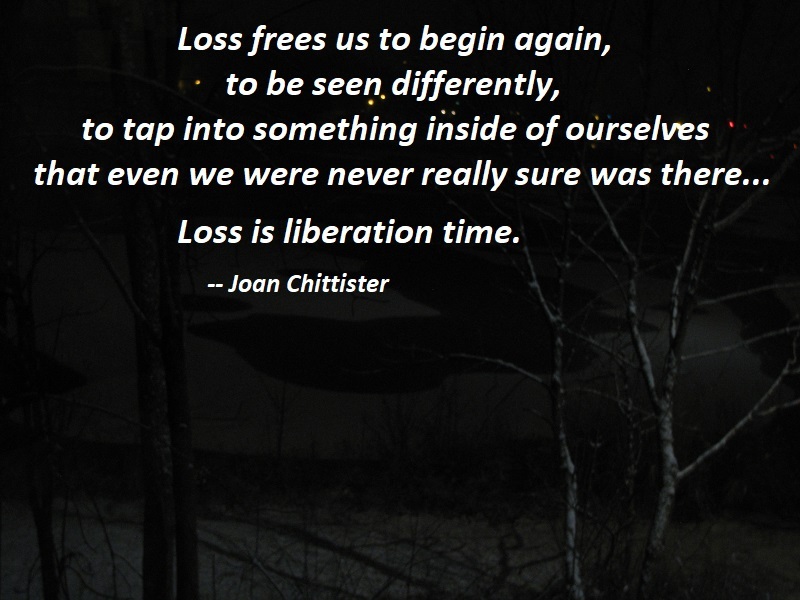 But we will never really know that until we lose a few and discover that the world does not end when we lose. Now it is just a matter of trying again somewhere else, perhaps. Now we’re free to be unnoticed. We’re free to do what we like best, what is needed most, what will bring us to the most we can be: the most happy, the most competent, the most satisfied with who we are and what we do. 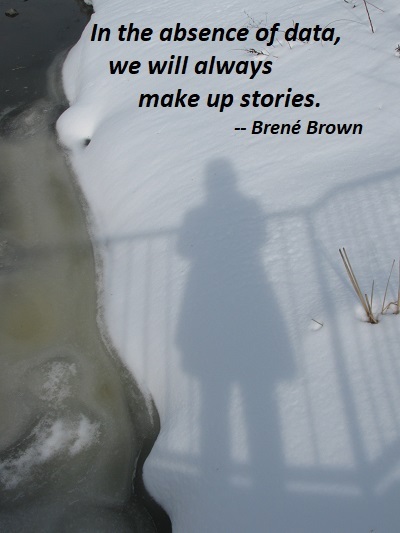 That means, of course, that we have to make choices about what we want to do and why we want to do it. 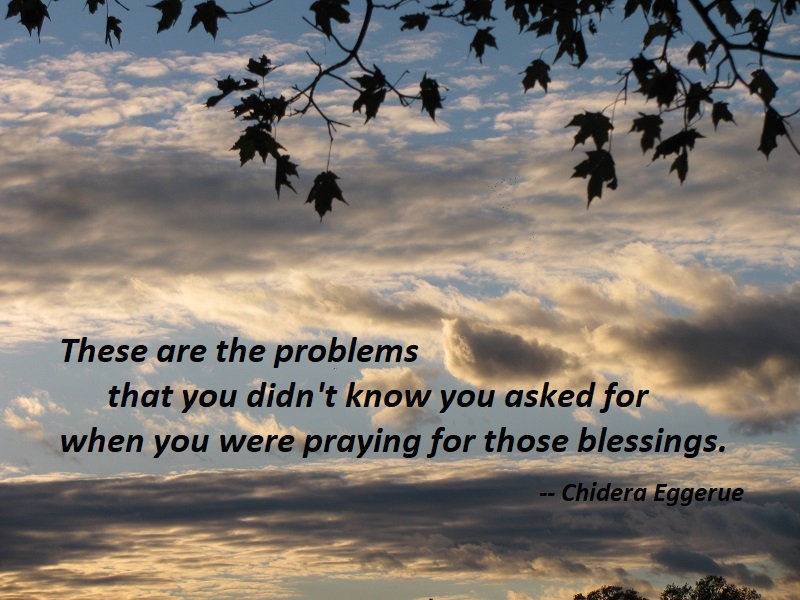 When it gets unbearable, it’s worth remembering: These are the problems that you didn’t know you asked for when you were praying for those blessings. 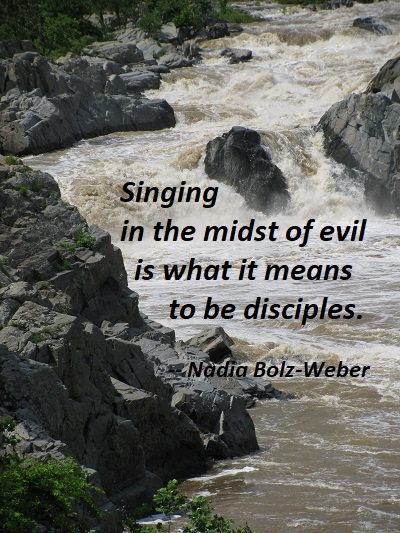 Singing in the midst of evil is what it means to be disciples. Like Mary Magdalene, the reason we can stand and weep and listen for Jesus is because we, like Mary, are bearers of resurrection, we are made new. On the third day, Jesus rose again, and we do not need to be afraid. To sing to God amidst sorrow is to defiantly proclaim, like Mary Magdalene did to the apostles, and like my friend Don did at Dylan Klebold’s funeral, that death is not the final word. To defiantly say, once again, that a light shines in the darkness and the darkness cannot, will not, shall not overcome it. And so, evil be damned, because even as we go to the grave, still we make our song alleluia. Alleluia. Alleluia. The greatest enemy of joy is fear. The quickest way to send your joy packing is to become afraid that it will leave or that something will happen to take it away. What a pitiful way to live! Nothing can be deeply enjoyed for fear it will soon be gone. 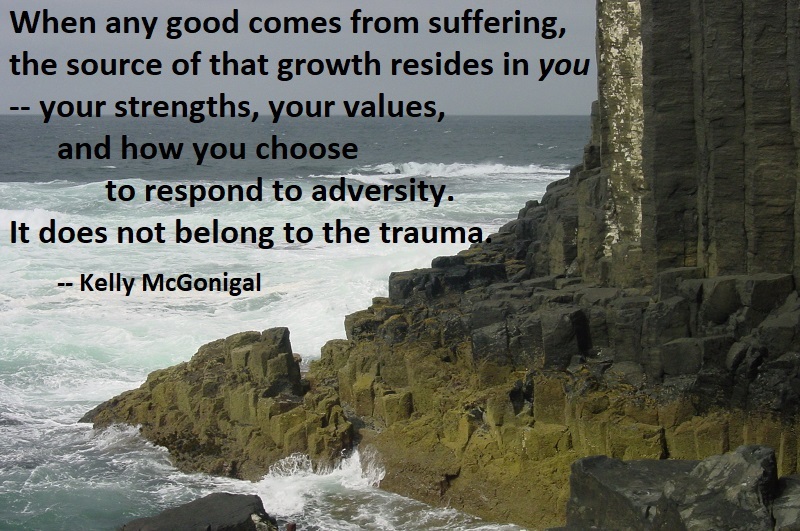 Paradoxically, however, the way to hold on to joy is not to cling to it. When trouble arises and I say, “Oh no, my joy is gone!” — then it will be gone. If instead I relax my grip on joy and release it to adversity, accepting whatever life may bring, then nothing can intimidate me and steal my joy. Joy dwells in an open hand. What are we so afraid of? 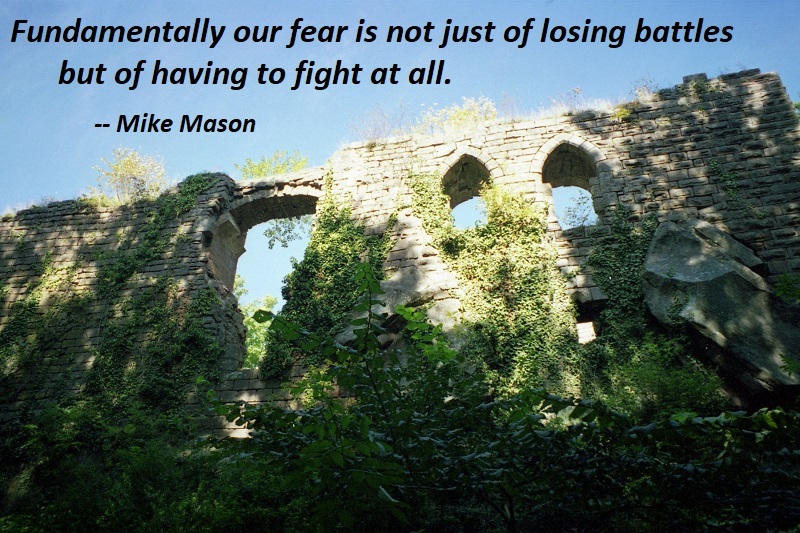 Fundamentally our fear is not just of losing battles but of having to fight at all. Overcome the reluctance to fight, and the fear of losing dissipates. You are currently browsing the archives for the Trials category.